One of my favorite flavors in the world is vanilla. Give me vanilla over chocolate any day and I'm a happy camper. I even love anything vanilla scented, such as my favorite Vanille Apricot perfume. However, something even better than vanilla, is VANILLA BEAN. When I see those little black flecks, in my ice cream especially, there's no denying that I'm going to want to try whatever it is in front of me. Truth be told though, I don't really do a lot of baking with vanilla bean, because they're so expensive at the grocery store. However, that's all going to change because vanilla beans are so easy to find now. Lately I've been buying them from Cost Plus/World Market and they're like $4 for 2 pods. Not too shabby for the ol wallet! 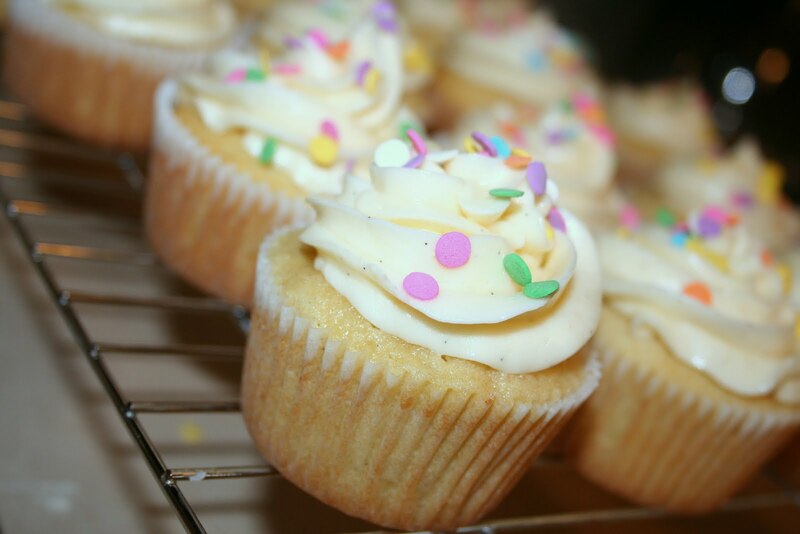 One of my first forays back in to the world of vanilla beans were these fantastic cupcakes from Hello, Cupcake! The batter was amazing - so velvety and rich! Combine the milk, oil and vanilla extract in a small bowl. Scrape the insides of one vanilla bean pod into the same bowl. In another medium bowl, using a stand or electric mixer on medium speed, cream the butter and sugar until light and fluffy. Add 1/3 of the flour mixture... combine just until blended. Add 1/2 of the milk mixture... combine just until blended. Add 1/2 of the remaining flour mixture... combine just until blended. Add the remaining milk mixture... combine just until blended. Add the remaining flour mixture and combine just until blended. Ensure the entire mixture is blended. Remove from oven and cool on wire rack for 10 minutes... then remove from pan and place on wire rack until cooled completely. Source: The Repressed Pastry Chef, as adapted from "Hello, Cupcake!" i usually get my vanilla beans from World Market too. Its a great deal if you can catch them on sale. i once got like 8 Madagascar beans for $10 i think?? anyway - these look delicious!